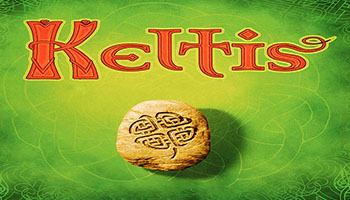 Keltis is a multi-player game based on Lost Cities, with some rules changes, later published with Knizia's original rules and theme as Lost Cities: The Board Game. Players play cards to move their playing pieces along stone paths. Cards show one of five different colors/symbols, each corresponding to one path; in addition, each card shows a number (0-10, twice each). In each color, each player can play his cards in either ascending or descending order. As in Lost Cities, it's better to concentrate on a few paths since the final spaces on a path grant high points, but ending early gives negative ones. The active player plays one card (out of a hand of eight) or discards one, then moves the corresponding playing piece on the path. 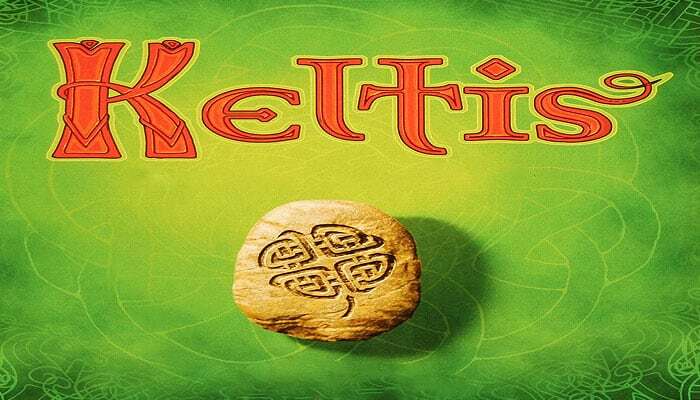 Many of the spaces have a token that grants some bonus: either immediate points (counted on the scoring track), an extra move on a path, or wishing stones that are needed at game end to avoid negative points. Pieces that moved only 1-3 steps earn negative points (-4, -3, -2). Pieces with 4+ steps earn points (1, 2, 3, 6, 7, 10). One piece of each player twice the height of other pieces scores double, either positive or negative. Holding fewer than two wish stones earns negative points (-3 / -4), while a collection of five or more stones yields a bonus of 10 points. All endgame points are added to any scored during the game. The player with the highest score wins! Players use numbered cards to move their figures as far as they can along the stone paths. For each path, players must choose whether to play their cards in ascending or descending value.